The all new compact A-series Lithium powered mini pallet truck boasts a small turning radius of 1330mm, making it ideal for transporting all kinds of goods over short distances in confined spaces. 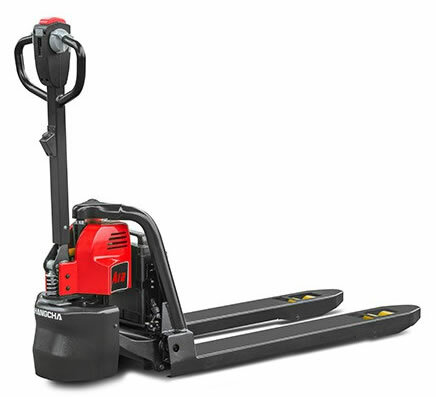 In contrast to conventional hand pallet trucks, the pallet truck moves goods using electrical power, whilst transporting goods of up to 1,200 kg. Boasting a low service weight of 130kg (Including battery) means the truck consumes up to 30% less energy than vehicles with lead-acid batteries. The high energy density of the installed lithium-ion battery also provides superb travel performance and long operating periods of up to 3.5 hours. Using a one-step battery exchange, the lithium-ion battery can be recharged with any standard 240V socket. What’s more, the battery is charged to full capacity after only 2 hours, increasing productivity around the warehouse. The lithium-ion battery has approximately twice the service life of a conventional lead-acid battery (approximately 1,200 charge cycles). Furthermore, the battery comes with a 3 years warranty and is completely maintenance free.